Adrienne and Dave are no ordinary couple and they have come up with a truly unique plan for their retirement. After selling the family home to their son, the couple built a Tiny House on wheels where they plan to spend their golden years in style! 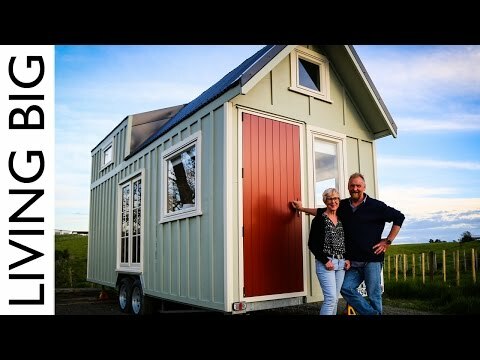 At roughly 2.5 meters (8ft) wide by 7.2 meters (24ft) in length, this Tiny House is a huge downsizing adventure for the couple, who perviously have lived in a significantly larger farm-style home. Despite the drastic change in size, the couple say that fitting their lives into the home has been simple as they are used to traveling and living out of suit-cases and therefore don’t have many possessions to bring with them into the new Tiny House on wheels. Seniors are using Tumbleweeds in several different ways. Some enjoy their tiny mobile dwellings as a comfortable alternative to the traditional RV. Others park in a family member’s backyard, giving them an opportunity to maintain independence and privacy while being near loved ones. Widows and single seniors find tiny living to be less stressful and more fulfilling. Could Tiny House RVs be the next senior-lifestyle trend? This is a tiny house on wheels with slide outs designed with baby boomers in mind by Tiny By Design. From the outside, you’ll notice it has a shed-style roof to maximize spaciousness when you’re inside. Once you’re inside, you’ll find a one-level floor plan with a living area, kitchen, an abundance of storage cabinets, closet space, a bathroom, slide-out bed, and additional loft space you can use for storage or additional sleeping space.